The following 72 events in 26 African countries include those listed in Google during the week of September 21-28 under the key words “International day of peace” and “Journée internationale de la paix.” The events also includes some listed on the event map for the International Day of Peace and on the facebook pages for the global feast and the International Cities of Peace as well as partiipants in One Day One Choir and Montessori schools singing for peace. See the page of events in the Arab States for those in North Africa. 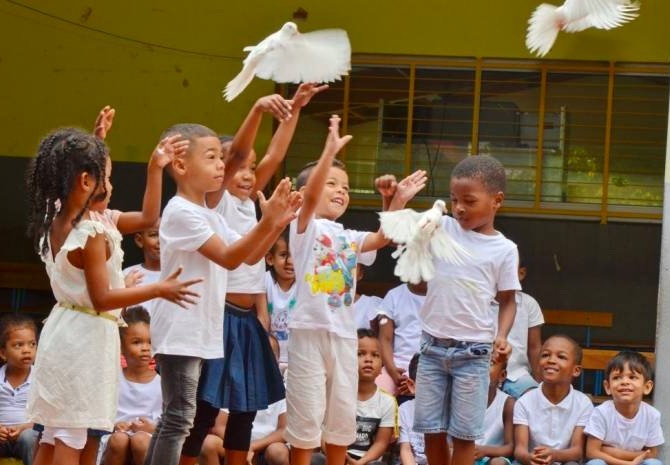 Release of doves at the end of the International Day of Peace at the Françoise Dolto school in Saint Pierre, Reunion. NATITINGOU, BENIN: The Peace and Education Association (APE-Benin) celebrated this Saturday, in the presence of the mayor of Natitingou Antoine N’da, the 2018 edition of the International Day of peace, under the theme “The right to peace: 70 years after the Universal Declaration of Human Rights”. Referring to the UN resolution, the president of the Peace and Education Association (APE-Benin) Rachidi Adam reminded the audience composed mainly of young, that the culture of peace is a set of values, attitudes, behaviors and lifestyles that reject violence and prevent conflict by attacking their roots through dialogue and negotiation between individuals, groups and states. BUJUMBURA, BURUNDI: CIAD Burundi, a non-governmental organization includes as one of its objectives to establish a Culture of Peace in Burundi through the establishment of spaces for dialogue, exchange and reflection on mechanisms for consolidating peace and social cohesion. On Friday, September 21, 2018 at noon, a tent will be erected in Bujumbura to collect your signatures in the Guestbook of Peace in Burundi. NGAOUNDÉRÉ, CAMEROON: Placed this year under the theme “the right to peace”, the international day of peace edition 2018 gave the opportunity to the men of God to raise prayers for peace in Cameroon. The related events organized in Ngaoundéré by the Association of Women and Girls of Adamaoua (AFFADA) was chaired by the governor of the region. Representatives of the political parties, the MRC, the UNDP and the CPDM also gave voice to a peaceful Cameroon before, during and after the presidential elections of 07 October. The governor said he was touched by the theme of this celebration and the timing of the 2018 edition, because it reminds the leaders of political parties in the presidential race in the region to be moderate in their speeches in order to avoid hate messages. The release of the doves, synonymous with peace, put an end to the celebration. DOUALA, CAMEROON; A peace song recorded by four of Cameroon’s top artists entitled Stand For Peace was released on this day. Cameroon as well as other countries in Africa are experiencing serious political crises and through this song, the artists preach a message of peace. BANGUI, CENTRAL AFRICAN REPUBLIC: The Minister of Labor, Employment, Vocational Training and Social Protection, Jean-Christophe Nguinza, chaired, Friday, September 21, 2018 in Bangui, the festivities marking the International Day of Peace, coupled with the ceremony of the inauguration of the building of the Kokoro Secondary Council, a work of the school-building of the youth of the basic communities 3rd and 6th arrondissements as well as Bimbo. KINSHASA, DEMOCRATIC REPUBLIC OF THE CONGO (DR CONGO): On the sidelines of the celebration of the International Day of Peace, a Capacity Building Workshop for Peace Journalists and Human Rights Actors was organized in collaboration with Monusco, the National Press Union in Congo (Unpc) and the Bureau of Agencies. United Nations systems on human rights. The Coordinator of the Association of Congolese Journalists for Peace (Ajcp), Ms. Christiane Ekambo KiengiMrs said that the peace reporter is a preventive journalist compared to the journalist of conflict or war. Unpc President Kasonga Tshilunde announced training workshops for journalists on the eve of the elections. GOMA, NORTH KIVU, DR CONGO: The women of North Kivu met in Goma this Friday, September 21, 2018 as part of the commemoration of the International Day of Peace For more than five hours, these women shared their experiences and discussed around the theme chosen at the global level “The right to peace, 70 years after the declaration of human rights” and unanimously expressed the wish to see the North Kivu province recover peace. They also blasted the fact that their province has become the stronghold of massive displacement of the population fleeing clashes between the Congolese army and the armed groups in different corners of the province. On the International Day of Peace, activists of the citizens’ movements organized a march to demand peace and the holding of credible elections in the country. The march of the citizen movements, including the Struggle for Change (LUCHA), started from the President Entrance to the provincial governorate, to the Himbi museum where they read their memorandum before being dispersed by the police. “We want free, credible and fair elections. We are asking the governor to bring us peace because he is the representative of Kinshasa power here. We also demand that voting machines be pruned from the electoral process. The next elections must lead us to peace and not to war. And to get there, we have to go in a scheme that suits all stakeholders, “said one of the protesters. NYANGEZI, DR CONGO: On this international day for peace, Congolese Females Action for Promoting Rights and Development (COFAPRI) organized activities for the city of peace in Nyangezi, DRC. Women, men and children joined discussions on ways they can move toward peace in their homes and in their communities. They also prayed and asked everyone reading this message to pray just for five seconds for our country the DR Congo to have peace one day. They also send lots of blessings to anyone involved in peace activities no matter who they are, where they are and in whatever way they are doing so. God bless all the Cities of Peace all over the world. LUBUMBASHI, DR CONGO:: John Mukhuta and the Lubumbashi City of Peace group in Katanga held an excellent Peace Day event. John has worked tirelessly over the last decade to take care of orphans, promote women’s rights, and bring his community to a new level of safety and health. This event highlights the group’s year-long effort, as sanctioned by local government and dignitaries, as well as the local U.N. peacekeeping force. LIBREVILLE, GABON: The Executive Bureau of the Panafrican Women’s Network for the Culture of Peace celebrated Friday in Libreville, the International Day of Peace. “Our peace project is about making every woman, of goodwill, living in this country, a development partner who lives and lives in a specific province and that it helps to make attractive,” said the president of the Network, Victory Lasseni Duboze. Also in the context of election news, “The political game allows the confrontation of ideas but no fighting that leads to divisions and rejection by each other,” she pleaded. LIBREVILLE, GABON: On the occasion of the International Day of Peace,the United Nations System organized, from 21 to 22 September, a series of activities aimed at nurturing young people on the notion of peace. The stadium of the national gendarmerie of the Gros-Bouquet camp, in the 1st district of Libreville, served as a framework for the events in which children in difficulty (from several reception centers), associations of women and young people … have communicated with other young people around the theme of this 10th edition namely “le droit.” The different agencies took the opportunity to showcase and explain to the public what they are doing to contribute to a world without violence. SANKORE, BRONG AHAFO REGION, GHANA:: Peace march includedmembers of a Peace Committee, students, market women, business owners and other concerned individuals and groups to demand for their right to peace which they have not enjoyed for almost decade due to incessant violent political rivalry between members of the two major Ghanaian political parties in their community. The programme was climaxed with a symposium to be attended by the Interior Minister, Members of Parliament, Security agencies, UNDP Country Office rep, traditional and political party leaders and others. MATHARE, NAIROBI, KENYA: The event for the International Day of Peace included classroom activities,group discussions and sports. MONROVIA, LIBERIA During the celebration of the International Day of Peace, we paraded from the Sports Commission to the Monrovia City Hall, Monrovia, Liberia. We also had an indoor program at the end of the parade. My message to everyone is to love peace, speak peace, live peace, do peace, sustain and maintain peace and dream peace always. NEW MATADI FANTI, LIBERIA Peace Talk brought together Youths and community stakeholders to discuss the importance of maintaining peace. This event will be held in New Matadi Fanti town community in Sinkor. ANTANANARIVO, MADAGASCAR: The FIMPA, an association that works for the protection of the consumer, organized an exchange-sharing session around democracy, perceived as the main instrument of peace. For this association, the day today also part in celebrating the 70 th anniversary of the Universal Declaration of Human Rights (UDHR). For them, talking about peace and democracy in an electoral context is relevant, because it calls for a peaceful electoral process. LILONGWE, MALAWI Malawi joined the rest of the world in commemorating the International Day of Peace in Lilongwe on 20th September 2018 under the theme Right to Peace. In partnership with the Malawi Government, Chancellor College, and other stakeholders, the United Nations converged high-level and community women in politics, business, faith, public service, uniform, academia and law to discuss their contributions to peace in their communities. BAMAKO, MALI: On 21 September, the African Youth Network for Populations and Development, AfriYAN Mali, in collaboration with the United Nations Multidimensional Integrated Stabilization Mission in Mali (MINUSMA) revived the International Day of Peace through a three-day workshop aimed at strengthening the capacities of young people and women on issues of peace. AFriYAN, the African Youth Network for Peoples and Development was created in December 2005 in Lusaka. This network aims to promote and increase youth participation in Africa’s development by strengthening their leadership and advocacy capacity. It is present in all African states. TIMBUKTU AND GOUZOUREY, MALI: As part of the International Day of Peace 2018, MINUSMA organized several activities in different regions of Mali to celebrate this day together. MINUSMA is the United Nations Multidimensional Integrated Mission for Stabilization in Mali. In Timbuktu, they organized a conference-debate on the theme ” Right to Peace ” and a friendly football match. In Bouzourey, the meeting involved the Mayor of the commune, traditional leaders, local authorities and young people of the locality. The day ended with a football match between two villages in Gouzourey commune: the Bagoundje team and the Wabaria team. SEGOU, MALI: Celebrating also the 70th anniversary of the Universal Declaration of Human Rights, during this International Day of Peace several activities were organized including a conference debate, a caravan and an evening for peace. These festivities were organized by the Federation of UNESCO Clubs. The program was broadcast in Ségou by Studio Tamani. ILORIN, NIGERIA: In Ilorin, Nigeria: City of Peace, Dr. Adimula Ruth Abiola presented the Global Peace Index at her University. IBADAN, NIGERIAThe 2018 International Peace Day was celebrated by many activities which include Church Service, Jummat Prayer, Peace Walk, Award to Peace Makers in the Society and the Peace day Celebration. IBADAN AND KUBWA, ABUJA, NIGERIA: Global feasts were held in these two cities as well as others in Nigeria. SAINT-PIERRE, REUNION: The program of the International Day of Peace in Saint-Pierre included a peace march with the College of the Bamboo Line, an intervention of the National Police at the Jean-Paul Sartre school for a moment of awareness about harassment and dangerous games, the planting of an olive tree at the Françoise Dolto kindergarten as well as a release of doves, a musical show with René-Paul and Paël Gigan, the distribution of an artificial white flower to the children and a exhibit about peace performed with Firmin Sinama Pongolle. KIGALI, RWANDA Never Again Rwanda in partnership with the National Unity and Reconciliation Commission and other peace actors marked the International Day of Peace at the Parliamentary building in Rwanda. The national local theme for this year is “Critical thinking for peace”, which stems from the need to strengthen capacities of youth and citizens to gain understanding in reflective thinking and creativity in addressing peace challenges in their communities. The event attracted participants from youth, governmental officials and CSOs representatives. DODOMA REGION, TANZANIA: The commemoration of the International Day Of Peace and the 70 years of Universal Declaration Of the Human Rights took place in the Dodoma region of Tanzania. HARARE, ZIMBABWE: The Zimbabwe Human Rights NGO Forum (the Forum), which has worked with many victims of organised violence and torture since 1998, led the peace day commemorations in Harare under the theme, “The Right to Peace: Building a just, inclusive and accountable Zimbabwe.” This year’s commemorations are organised in collaboration with the Zimbabwe Human Rights Association (ZimRights), Theatre in the Park, Renewal Fellowship and Youth Empowerment for Transformation Trust (YETT). The commemorations reflect the diverse groups that are all key for building sustainable peace. Bringing together young leaders, civil society and church leaders, the commemorations give Zimbabwe an opportunity to explore inclusive strategies for building a just, inclusive and accountable Zimbabwe. Part of the attractions will also feature a theatre production on Heal the Wounds by Rooftop Promotions.